Cats + Boxes = CUTE!! Happy Friday! 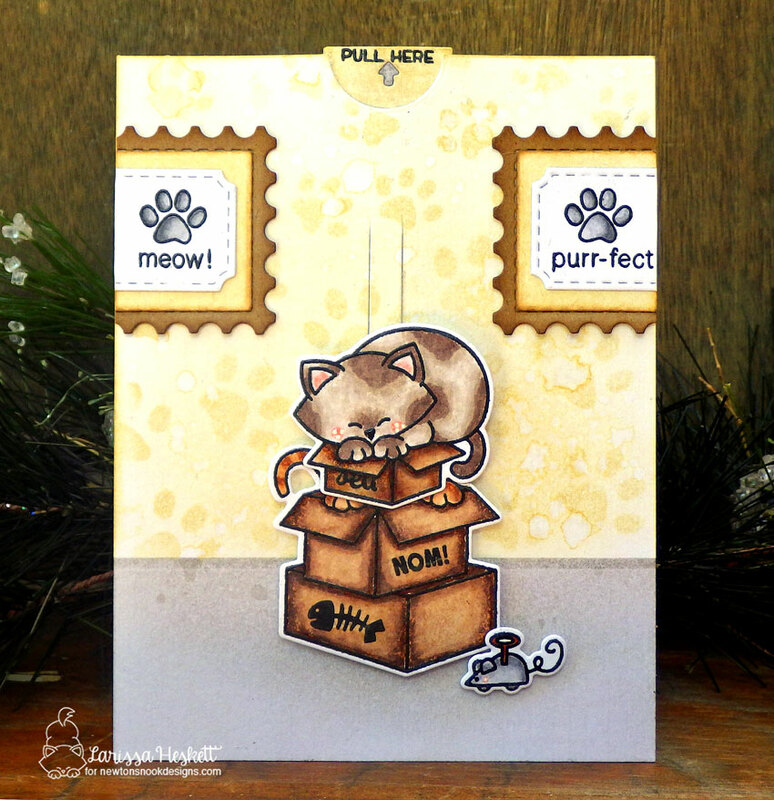 Today we have TWO adorable cards by Larissa using our Newton Loves Boxes Stamp Set! She created two adorable creations by mixing this new set with some old favorites! 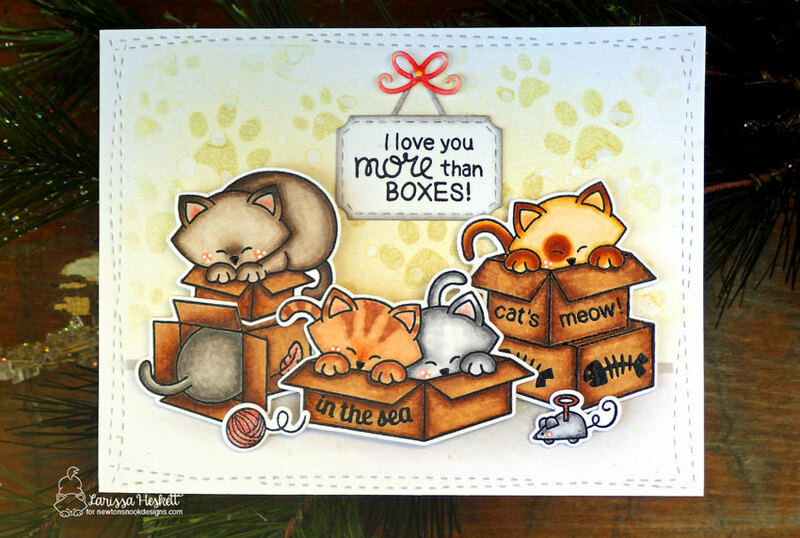 On her first card she stamped all four of the images of the kitties in boxes from the Newton Loves Boxes Stamp Set and cut them out using the coordinating Newton Loves Boxes Die Set. She added in some fun details onto all the boxes too! She stamped the words "cat's meow" and some fishbones, both from the Newton's Antics Stamp Set, on the sides of the box on the right. For the center box she added "in the sea" from the Tranquil Tides Stamp Set on the box front. The box on the left has a cute little feather added on from the Newton's Birthday Flutter Stamp Set. Then she added in a ball of yarn and little wind up mouse in front, both from the Newton's Antics Stamp Set. 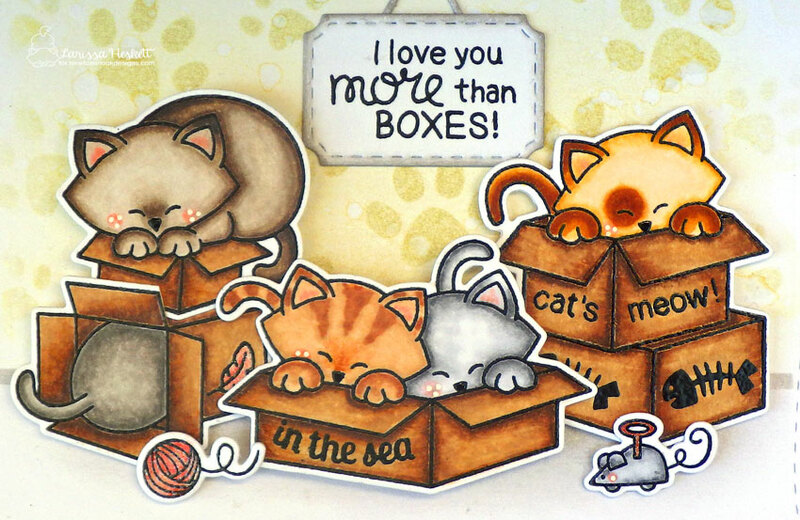 For her background she created some fun pawprints using the Pawprints Stencil and added the sentiment "I love you more than boxes" from the Newton Loves Boxes Stamp Set. The cute little ticket frame was cut out using the Framework Die Set. For her second card today she created a fun interactive pull tab card! 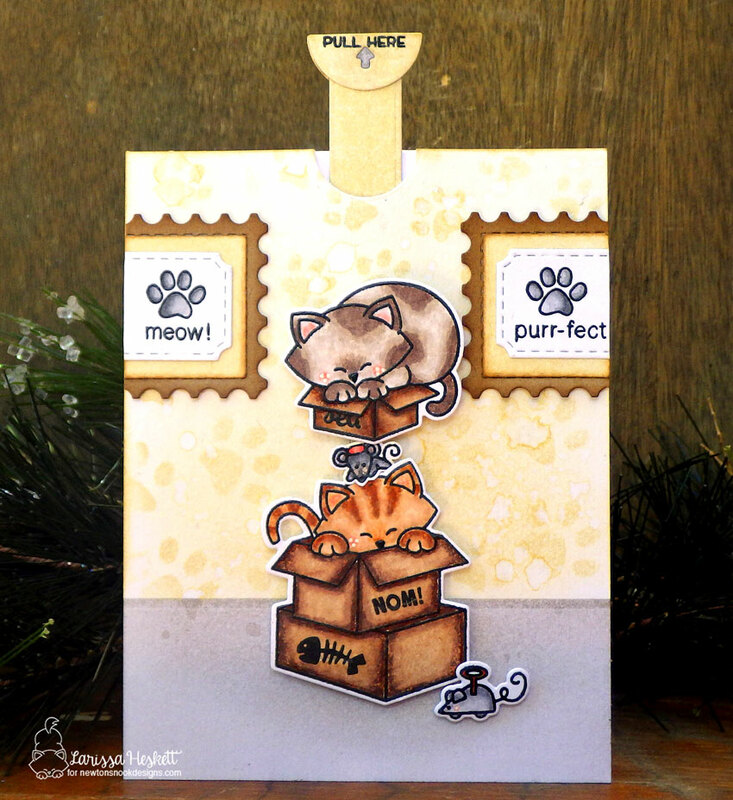 She stamped two images of the kitties in boxes from the Newton Loves Boxes Stamp Set and cut them out with the coordinating Newton Loves Boxes Die Set and then she stacked them over each other, attaching the top kitty to a pull tab so the recipient gets to pull to reveal the second kitty beneath! How fun is that!? She also added on some fun box decorations, again using the fishbone from the Newton's Antics Stamp Set and the word "nom" from the Shark Bites Stamp Set. She snuck a little mouse on the orange kitties head too, masking him from the Santa Paws Newton Stamp Set. For the card background she created a fun room with pawprint wallpaper (created using the Pawprints Stencil) and some cute little framed pawprint pictures. For the frames she die cut the postage edge and ticked shapes using our Framework Die Set and added in the pawprints and words from the Newton's Antics Stamp Set! So fun and creative! Thank you, Larissa, for the stunning creations today! To say hello to Larissa and see more of her creations, visit her over at her blog, Larissa Heskett Designs. These cards are too cute!